Recently, Aced My Interview had the pleasure of working with The Academy of Milford’s school counselors to help their students get a first-hand feel for what an interview is like. The school counselor, Kaitlin, reached out to AMI last year because of the disconnect she was seeing when students had trouble finding and interviewing for jobs. Students would regularly graduate with post-secondary plans to attend college or trade schools, but there were few reliable resources for students going directly into the workforce. She wanted to give her time to every student, but realized it was impossible due to conflicting schedules and an understaffed office. Kaitlin also knew that her office traditionally focused on helping the students going to college and there were no resources for those going directly into the workforce. With minimal time to evaluate and help every student interview, Kaitlin asked for AMI’s help. You can also read all about landing a job with little to no experience here. Aced My Interview worked with Kaitlin to ensure that each student received the attention and feedback needed to help these future professionals hone their skills. Through live video chat, AMI conducted 20-minute mock-interview sessions for Kaitlin’s junior & senior classes. After their mock-interviews, students received an AcedCard. 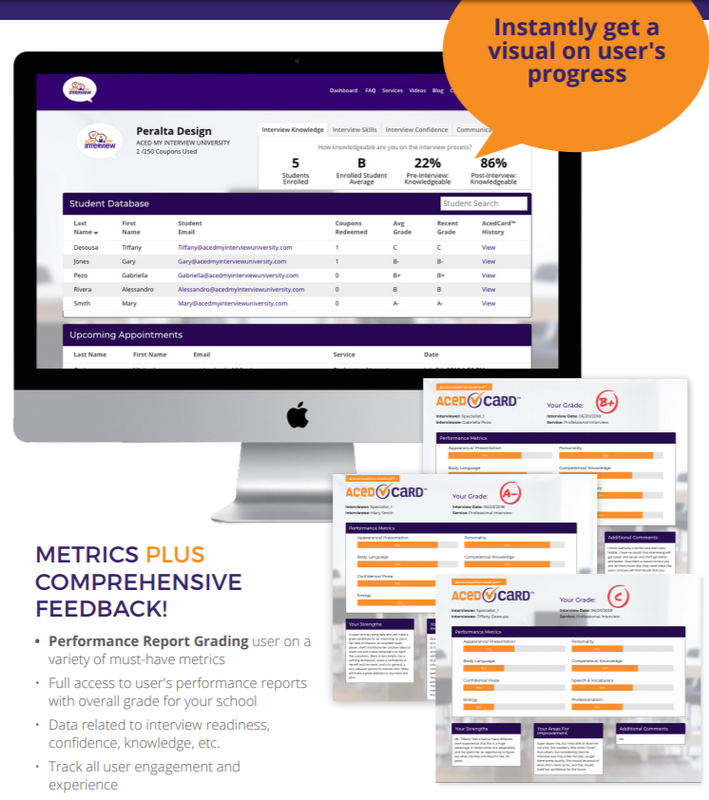 AcedCards are a digital performance report card that algorithmically grades the student based on a variety of metrics i.e, professionalism, communication skills, non-verbal queues, etc. There’s also a section for descriptive feedback, where the interviewer can freely critique the interviewees skill-set in detail.